Extra! Extra! 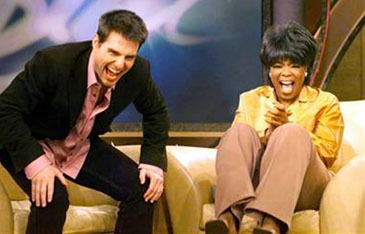 Tom Cruise Jumps On a Couch, Becomes a Psychiatry Expert, and Loses Sanity! "I'm in love! I'm in love!" By now, unless you've been living underneath a rock or were stranded on a remote island paradise with polar bears and secret hatches, you're undoubtedly familiar with Hollywood icon Tom Cruise's couch-jumping incident on the Oprah Winfrey show back in May. That is where the twice-married Cruise declared his love for actress Katie Holmes. The act created a surreal media sensation that had his fans joking and laughing, his publicist cringing, and bloggers everywhere dancing with glee...and that was just the beginning. There was plenty to be suspicious and cynical about TomKat, as the media dubbed the pair. After all, in what was surely just a small coincidence, both Cruise and Holmes had major summer-event movies being released just weeks apart this year: he in War of the Worlds and she in Batman Begins. Was it a ruse? Was the whole love affair a clever marketing ploy? Could something as pure as love be fabricated? Many in the entertainment news world were coolly predicting that the romance would soon fizzle and probably wouldn't last beyond, say, the time that War of the Worlds left the multiplex theaters. Others were even suggesting that Tom was paying Katie to be his beard.